The official FC Barcelona app for Windows Phone is now available. 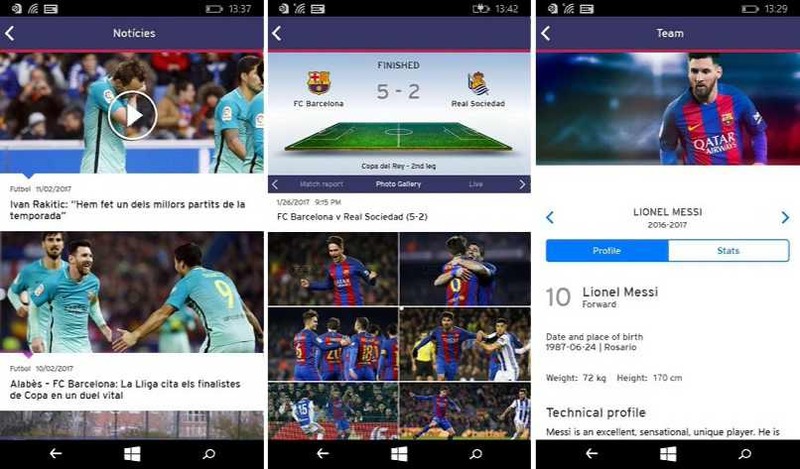 The new app brings Barça news, real-time match updates, highlights and videos and more. Also, with this app, you can access the official FCB Store to buy Barça jerseys and other accessories. Official Futbol Club Barcelona news for all teams. Sports selector to follow your favorite teams including Soccer, Barça B, Women’s Soccer, Basketball, Handball, Futsal and Roller Hockey. Real-time scores, match reports, notifications. Buy tickets to upcoming matches and the Camp Nou Tour and Barça Museum while visiting our Catalan heroes. Follow the squad and get updates about your favorite players, such as Messi, Neymar, and Suárez. Access the official FCB Store to buy Barça jerseys and other accessories. You can download the app from the app store or from the link below.